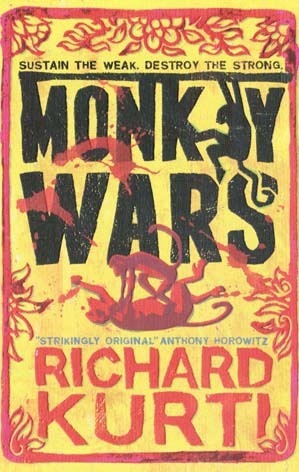 Monkey Wars by Richard Kurti has been the biggest surprise of the year for me. I'll admit, if it weren't for my commitment to promoting British YA authors this year and also if not for the passionate words of a dedicated publicists, I might have passed up the opportunity to read this book. And that would have been an absolute shame, because Monkey Wars is one of my favourite books that I've read all year. It's exciting and interesting and I never wanted to put it down. This story and these characters got under my skin in a way that I haven't experienced in a long time. That first night after reading the first 50 pages of the book I had a dream about this book. Because even in my sleep my brain still wanted to go over the mostly violent things that I'd witnessed while reading this book. What I love about this book is that we see this war between Rhesus and Langur monkeys from both sides and we really get a feeling for what it's like to be in either camp. Each of the main characters - Papina, Mico, Twitcher, Tyrell - all had such wonderful personalities and voices and different ways of thinking that it was easy to relate to them, and to sympathise with the complicated feelings of loyalty and belonging and pride that go along with the horrible effects of war. Monkey Wars begins in a really dramatic way, with the near-massacre of the Rhesus monkeys who lived peacefully in a cemetary in Kolkatta until the death of a human causes the Langur to attack the Rhesus as a means of protecting humans. With this initial attack, the Langur monkeys seek to further their own power and dominance by taking further steps against the Rhesus and one monkey in particular seeks to use his own talents in order to gain more and more power for himself within his own community. While my heart really went out to Papina and the rest of the Rhesus refugees who have to go out into the city and start over with their lives and deal with truly terrifying circumstances, it is Mico who really stole my heart within this book. It was fascinating but also pretty sad to see young Mico transform from the naive, questioning monkey into what he becomes as the trusted advisor of a power-hungry dictator who is set to wrest all control over the Langur and Rhesus monkeys for himself. This isn't a historical novel at all, but you can see the similarities within these monkey wars to that of Stalin and Hitler. The gradual rise to power, the twisting of knowledge, the decline amongst the Langur for free-thought, the ways in which things are manipulated to one person's favour. I love also Mico's struggles with his morals. Does he sit back and allow Tyrell to get further out of control or he does he speak out and try to change things? While everything may appear clear cut in what a monkey should do in this sort of situation, Kurti shows how often things aren't as black-and-white as they may seem. Monkey Wars was such an exciting book. There is a lot of action involved, lots of fighting and dramatic happenings. The chapters are relatively short which further ramped up the tension levels for me. I found my heart beating wildly, always wanting to know what would happen next, especially as I got more emotionally invested in the lives of Mico and Papina. Monkeys, politics and war might not sound like your sort of thing, but I promise you, this book is endlessly fascinating and complex. I highly recommend it! 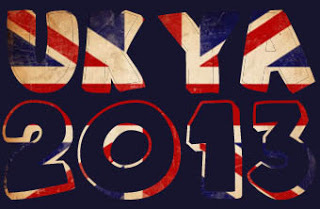 You've got me really excited for this!